It is Saturday and I am finally recovered from a nasty bout of sickness, happy to be here and deciding that it is a healthy, fat bomb, pecany goodness moment; which needs to be shared. We are gearing up for my spring cleanse and I always prep my body in advance by switching my diet to a much healthier way of eating. It's time to begin the arduous task of ditching winter weight, get the fat kid status foods out, get back into working out mode, and that means healthy wholefoods! 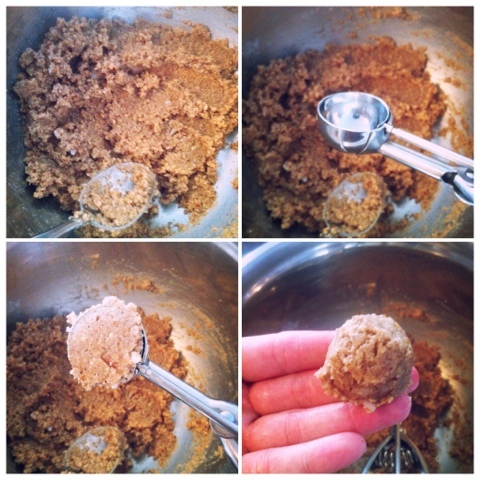 I am going to begin some fun noms with a recipe for healthy, refined sugar-free, quick snack, Pecan Pie Fat Bombs! 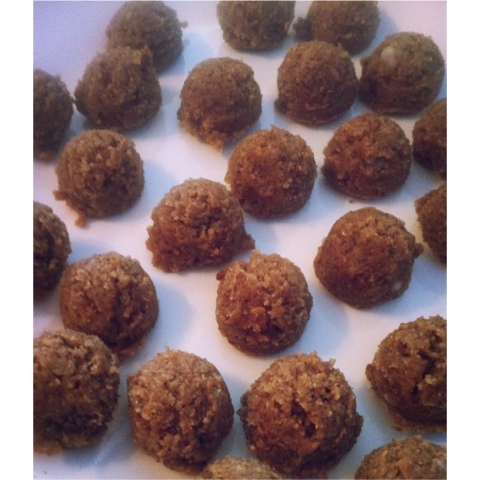 I know that the keto fat bombs have heavy cream and or butter along with the nuts and other ingredients, however, I am steering clear of dairy as I am allergic and I prefer to get my body into vegan/vegetarian mode for cleanse prep. Don't be concerned, these beauties won't let you down and they're super tasty, really cute, little one pop bites of bliss, full of good-for-you fats. -Place in freezer for a good hour before serving, I like to keep mine frozen all the time and serve them straight from the freezer. The high fat content keeps them slightly soft. * Remember, these are high in good fats but that means you are not to sit and scarf the lot of them in one sitting. Talk about a girdle busting, fatty liver inducing, gut pain problem waiting to happen. Moderation sweetpea's, that's the ticket! I eat one before my workout with a fruit or two within 45 minutes of my workout to give my body healthy fuel. For those of you concerned about fat you need to research all the new studies coming out about how important fat is in our diet. A healthy dose of fat is essential to allow the body to absorb vitamins and nutrients from other foods. I really enjoy using this little scooper, usually he only comes out to play during the holiday season. Look how sweet and tiny, they fit on my finger tips. Teehee! All loaded and ready to be blasted by the cold of my freezer! 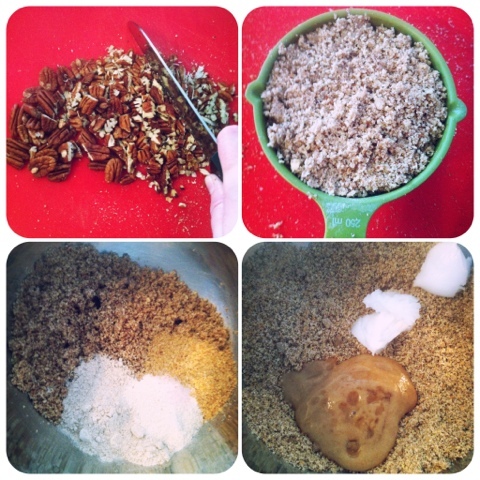 I pressed a few whole pecans on the top just to make them pretty and specify the nut used inside for people who were eating them, as I made a few different nut-based healthy snack recipes. Will post those later on for sure. Easy as pie, (pardon the pun) and quick to make, these are delightful! 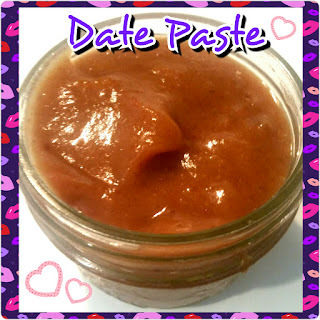 It's Rawfood, Vegan, Paleo, Wholefoods, Gluten-free fabulousness; enjoy! 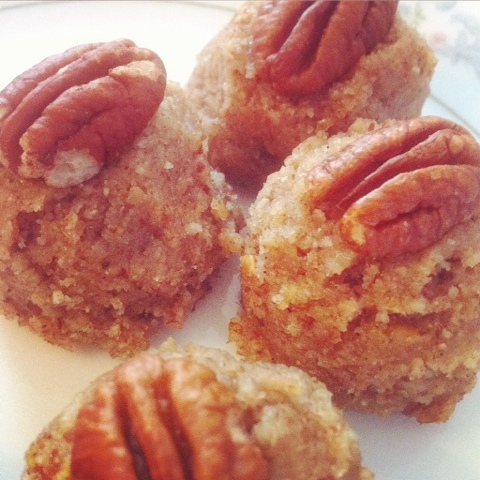 1 comment on "Gluten-free Pecan Pie Fat Bombs-refined sugar-free, rawfood vegan, & paleo"